One of the most satisfying photographic trips that I’ve ever made was undoubtedly a tramping (=hiking for non-Kiwis) trip that we undertook recently in the upper Cobb Valley, which drains north east from the Kahurangi National Park to enter Golden Bay near Takaka (Nelson, NZ). The upper parts of this valley form a spectacular alpine basin that was the location for one of New Zealand’s earliest hydropower schemes (see its history here). Construction of the dam was started by a local pipe manufacturer before being taken over by the government during WWII; it was eventually sold as part of NZ’s disastrous electricity market experiment. Access to the valley is courtesy of a road built to facilitate dam construction – a narrow and twisty gravel affair that winds its way uphill around a tortuous series of switchbacks, before curving around the side of the long reservoir and ending beside Trilobite Hut. We drove up in the afternoon, having flown into Nelson and picking up a rental car; we arrived at the road end with just a few hours of daylight in which to walk several kilometers up the first part of the valley. 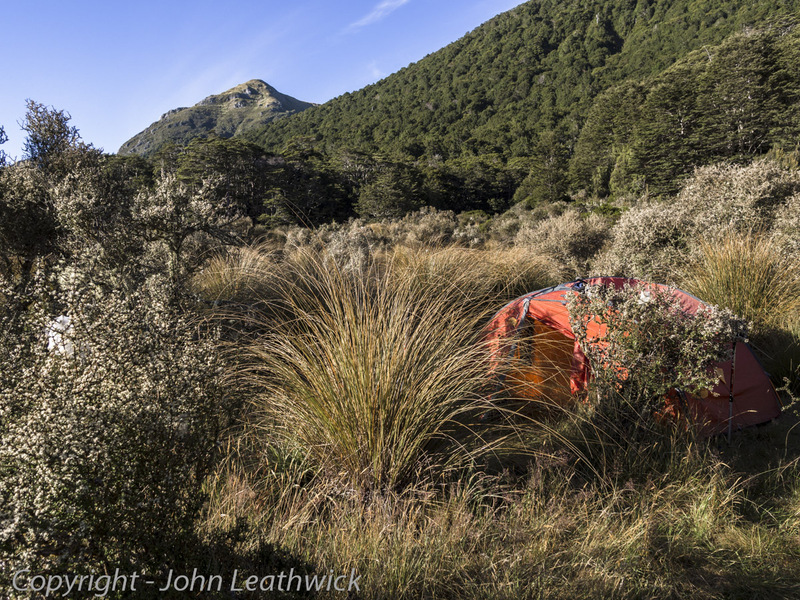 As the sun dropped lower we found a grassy river terrace on which to pitch our tent, a site surrounded by scrubby daisy bushes (Olearia) with their sweet-scented flowers producing amounts of perfume that were at times almost over-powering. The noise of the river coming from just a few metres away lulled us to sleep – a great place to spend a first night back out in wilderness country after too long a stretch of unbroken city-dwelling!